Hello and welcome to my…what is this…the second or is it third? Well, whatever, welcome to my Best Images of the Year post. It was hell. Either I’m getting worse as a photographer or I’m just more picky about my images, but damn if it wasn’t hard to compile my best shots this year. The fact that I didn’t get anything decent until May is a pretty good indication of my mediocrity. Whenever I edit a batch of photos in Lightroom, I make a point to rate them with the 5-star system. Sometimes my ratings change over time, but mostly they stay the same. I think I had one 5-star image, but downgraded it later leaving none. Overall I think I did a better job with light this year, but my narrowness of subject began to bore me. Still, I did manage to generate images that I like and without further whining, here’s what I’ve got. As always they are in the order taken during the year. 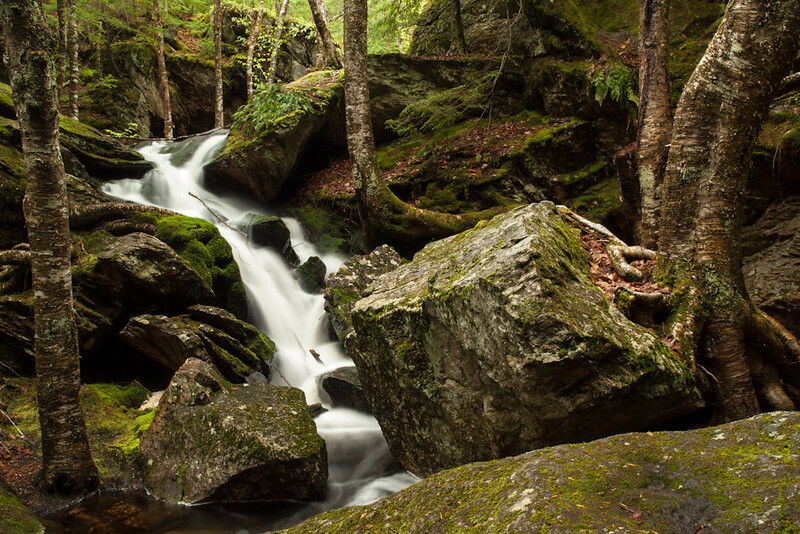 This waterfall is in Pulpit Rock Conservation Area in Bedford, NH. I shot it from this angle for the first time this year and was amazed at my stupidity at not finding this view before. While steep and off the main trail, it isn’t hard to get to. The composition is very strong and came together naturally. The light was kind and the balance and heft the trees contribute adds a lovely symmetry, vigor and depth. Even the rocks cleaned up for me. Next is a shot of High Bridge over the Piscataquog river in New Boston, NH. It is now repaired, but when I shot this the deck still had some holes and the I-beams were pretty rusty. I did not set foot on it. I love this shot because it’s powerful. I chose and set up carefully to emphasize the amount of water while also showing the gorge itself and of course the bridge. A fair amount of planning went into this shot and I picked my moment pretty well for maximum white water. I also managed the post-processing to bring up the new leaves on the trees and I like the effect. I love this shot for a lot of reasons. First is that it is a relatively rare Luna Moth and only the second I’ve ever seen. Second because I did see it, which was an amazing piece of luck. I was on the last leg of an afternoon hike, coming pretty fast down the trail at the Harris Center for Conservation Education in Hancock, NH. Somehow I noticed a difference in the green or the shape in the undergrowth and stopped to check it out. I was flabbergasted to see this gorgeous creature just emerged from its chrysalis and pumping up those glorious wings. The light was perfect and I shot and shot and shot. What a fantastic experience it was and I’m so glad to have been a witness to this insect’s very short, but intriguing life. The next one just happens to be an insect shot, too, although it didn’t start out that way. I went to shoot the sundew which are tiny, carnivorous plants. They secrete minute droplets of basically sugar to attract bugs which are then trapped and are gradually subsumed and digested by the plant. This one is one of millions in the Ponemah Bog Conservation Area in Amherst, NH and at first I didn’t notice the tiny whitefly, but I’m glad it’s there, even if it was probably doomed. The clarity (thanks to the OM 90mm macro), the complexity and the strangeness of the shot just make it for me (not to mention the light which is pretty fab). Next year I hope to work more with these little wonders and photograph them in bloom. This is kind of a strange one for me even though I fly a few times a year. I just happened to look out the window as we arced over the American west. 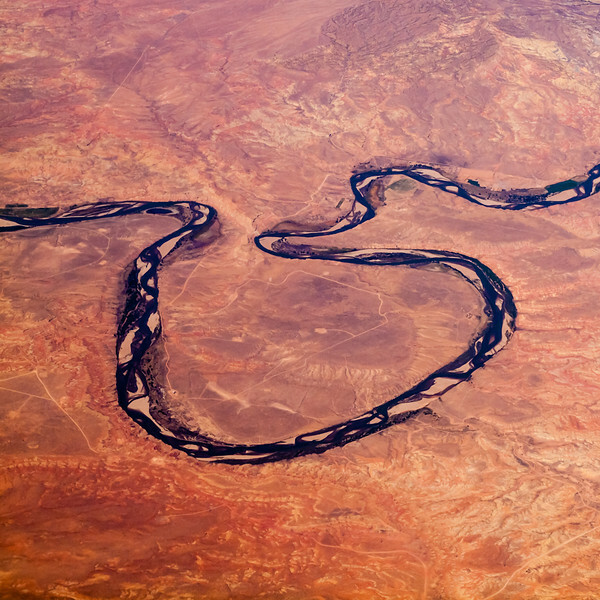 The color just knocked me out and when I saw the big bend coming up in that ribbon of river, I hauled out the camera (and lost my eyecup in the bargain, doh!). Luckily the window wasn’t too filthy and I managed a relatively clean image. A square crop gives it some tension and balance to my eye and I like how bold it is. If you’ve been following along this year, you’re no doubt aware I caught a mega-dose of Mushroom Madness and even though there were a lot of good shots, I think you’ll agree this one takes the prize. While out to do some waterfall work, I found a huge swath of these coppery beauties. After a few failed attempts at shooting little groups of them, I spied this loner. With the soft light and the contrasting color of the moss it really pops. I love it and the OM 90mm shines as usual. Funny how many of my abstract shots involve water. On a meetup to do a waterfall shoot at Garwin Falls in Wilton, NH, I ended up at this pool below a small cascade. 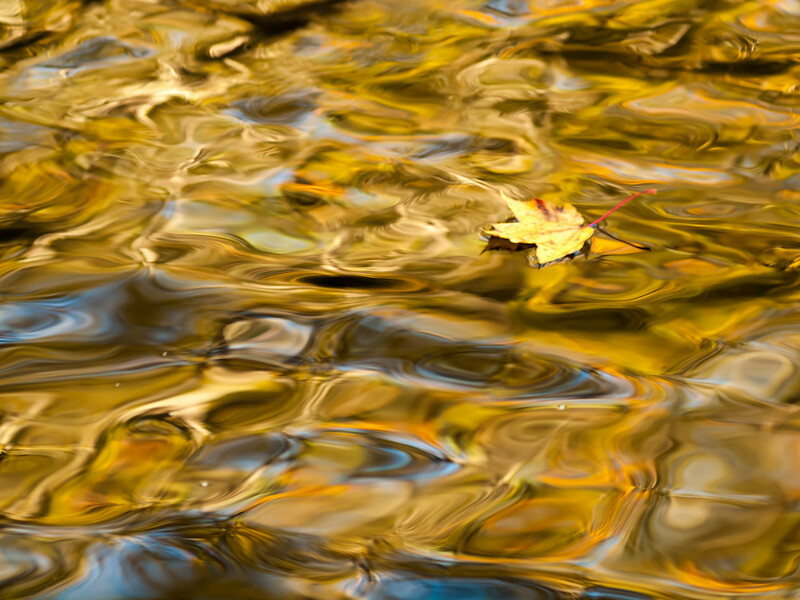 The ripples and the reflection of the sky and leaves overhead was mesmerizing and I followed this little leaf around until I had it where I wanted it. Who am I kidding…I was totally at its mercy! I used the OM 90mm which is also a pretty terrific medium-telephoto and it sure was challenging to manage the focus and track the leaf. It’s on the list because it is a bit different for me and I was glad that I saw the image even before I shot it. Plus it’s just fascinating to look at…soft and ripply and the colors are so vivid. Ok. You caught me. Another mushroom shot, but damn, just look at it! That light just knocks me out! Plus it’s a microscape which is something I’ve been working on for a while now. 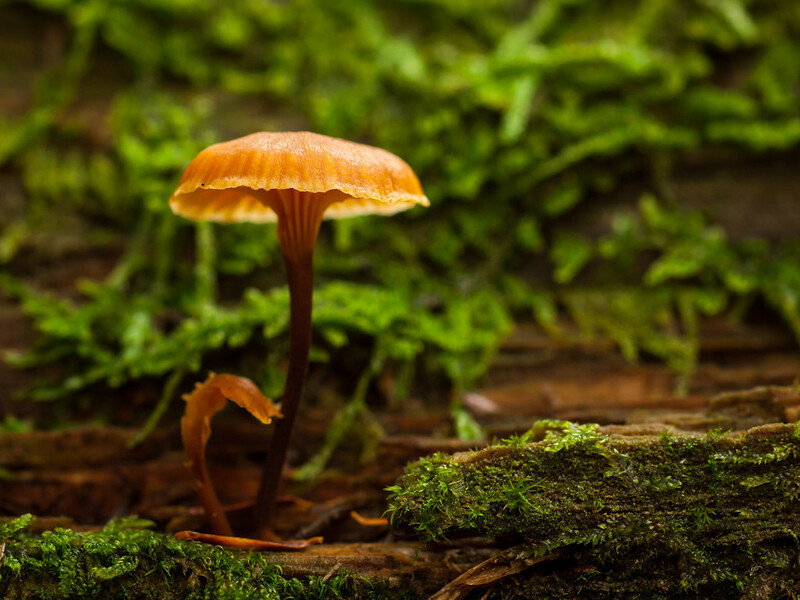 These little slices of the forest floor are so magical to me and mostly I shoot them as I find them. This one though got a little clean up on top of the log. The leaves though were artfully arranged by nature in the Henderson Swasey Town Forest, Exeter, NH. I like it because it’s playful and has good composition, focus and light. Another waterfall shot, but very different from Pulpit Rock falls. This one was an unexpected treat and I raced the sun clearing up debris that really ruined the shot. 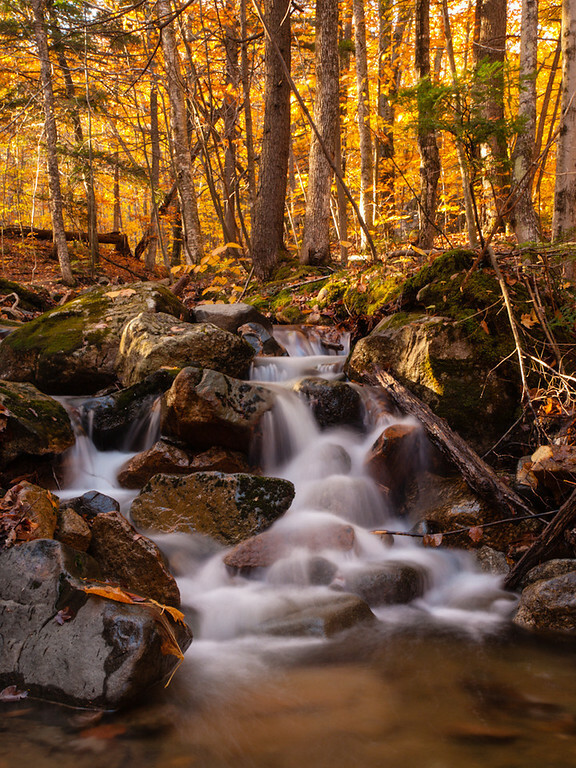 With tripod precariously placed I managed not only to have great light in the trees, but also in the stream itself. No direct sun on the falls meant no blown highlights, but it just skims the rocks and I really like the added zip. I think this represents my ability to see and compose quickly enough to take advantage of excellent light that doesn’t last, something I have improved over the last couple years. And now for something completely different…well kinda. Yeah it’s another waterfall, but the whole feeling is altered. 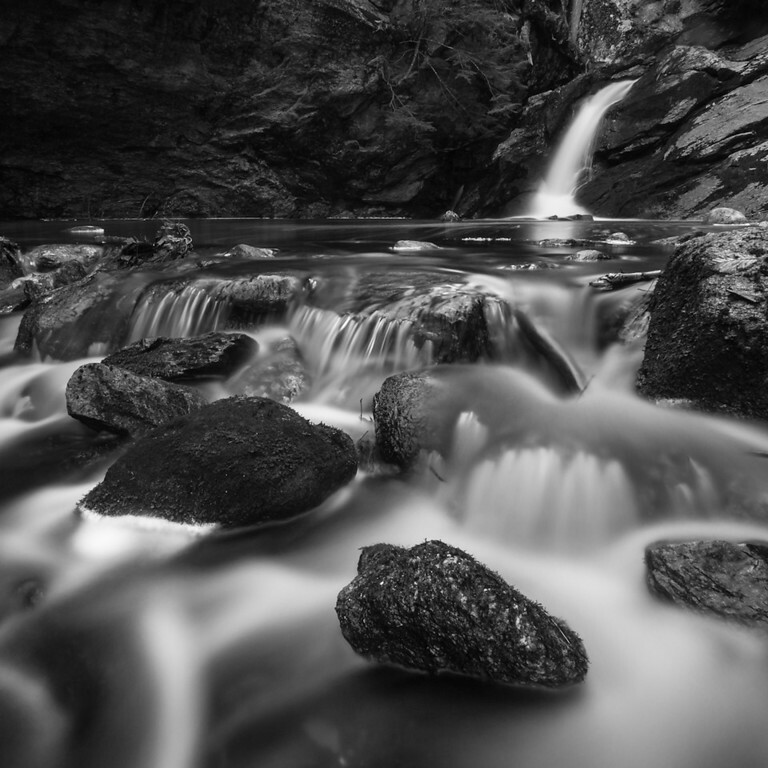 The drama is more stark and austere and I love the deep contrast between the dark gorge walls and the water itself. 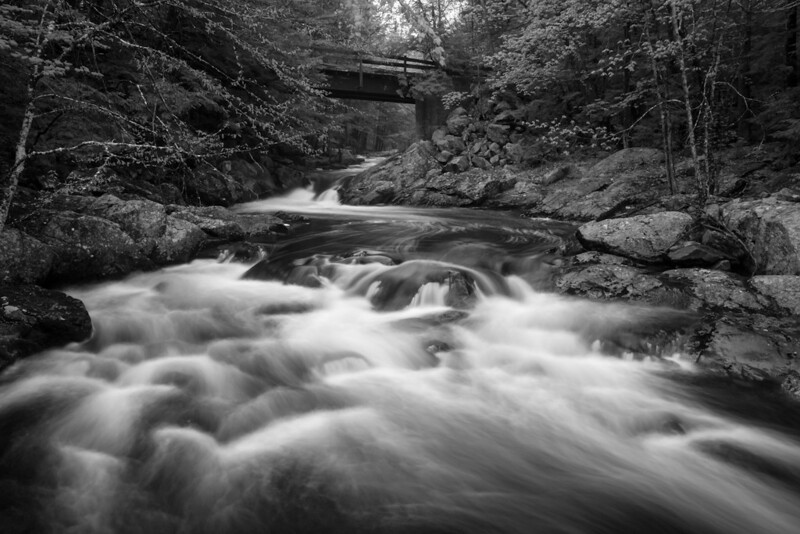 I have shot these falls before, but the mood is so different that it might be another place altogether. The camera was so low and close to the flow that the lens kept getting splashed and I had a lot of do-overs. The results are strong for composition, interest and exposure, so it goes on the list. I dig how that closest rock seems to float. Oh this is Upper Purgatory Falls in Mont Vernon, NH. This next one is from a group of images that I haven’t shared on this blog before, but will soon. Earlier this year I found a dead crow on my lawn. Being the person I am, I left it there because I had a feeling it would yield excellent photographic possibilities and I wasn’t wrong. 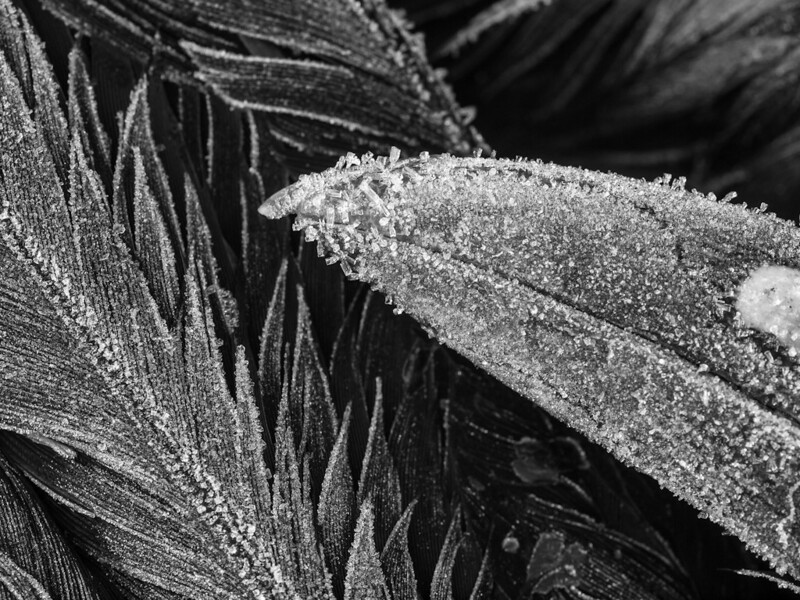 The morning of our first hard frost I went out to see and wow, it was pretty awesome. Check out the detail in the feathers – such fantastic texture (thanks again to my old OM 90mm). The sun went to work melting the tiny crystals, but I got there first. Yes, it’s a dead creature, but I did not kill it and I think if you look hard enough you can find beauty in almost anything nature brings, even death. Last is another shot I haven’t shared here yet and another one involving death. Frequent readers will not be surprised at my inclusion of a cemetery image in my top picks. Even without the fog, this would be a pretty intense shot, but the fog just wraps everything close and confines your view, if not your imagination. 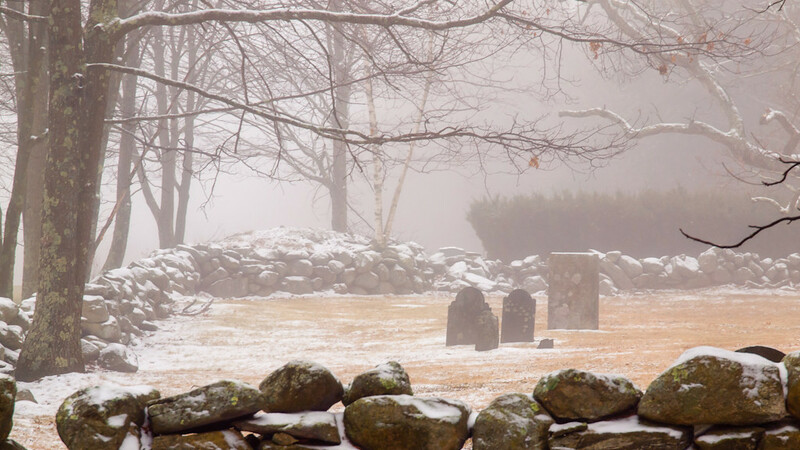 While I was driving to this location, which is Old Hill Cemetery in Londonderry, NH, I knew I’d include the wall in the shot because of the scrim of snow and because stone walls are so typical of old cemeteries around here. I like how the big branch balances the wall and frames the scene. I think I had to stand in the road for this one, but it was worth the risk. So that’s the lot, the best images I made in 2012. 2013 is going to be a VERY different year, that much I can tell you. See, I got a job. Full time. I haven’t worked for a few years now and have been able to devote a lot of time to photography. It’s been an incredible opportunity to rekindle my old love affair with it and to develop my skills so that I’m a pretty passable art-teest these days. But it’s time for me to go back to work and the absolute perfect situation landed in my lap over the Thanksgiving holiday. Earlier this month I completed all my meetings with the decision makers (one of which I had to fly to Atlanta for), got an offer, finished negotiations and should begin work on January 7 (pending a bg check). I’m really excited about it and I know it’s the right next step for the career I’ve ignored for too long. So where does this leave me, my photography and this blog? Hopefully with new possibilities. No, I won’t have my days to myself anymore and will no doubt turn into a weekend warrior. I will be traveling a bit more though, and while I probably won’t be toting my big rig around much, I will have an iPhone and boy won’t that be something different? Yeah, old hat to most of you, but not to me and I’m pretty psyched to be able to have a camera in other situations besides hiking. I’m looking forward to exercising my photographer’s eye outside of the woods and nature. To take more slices of life I guess. I promise not to take pictures of my lunch. Anyway…that wraps up 2012. Thanks to all my readers and followers who enjoy the blog give me feedback. If you haven’t, don’t by shy. I don’t bite. Love your work! Inspires me to try and do better. 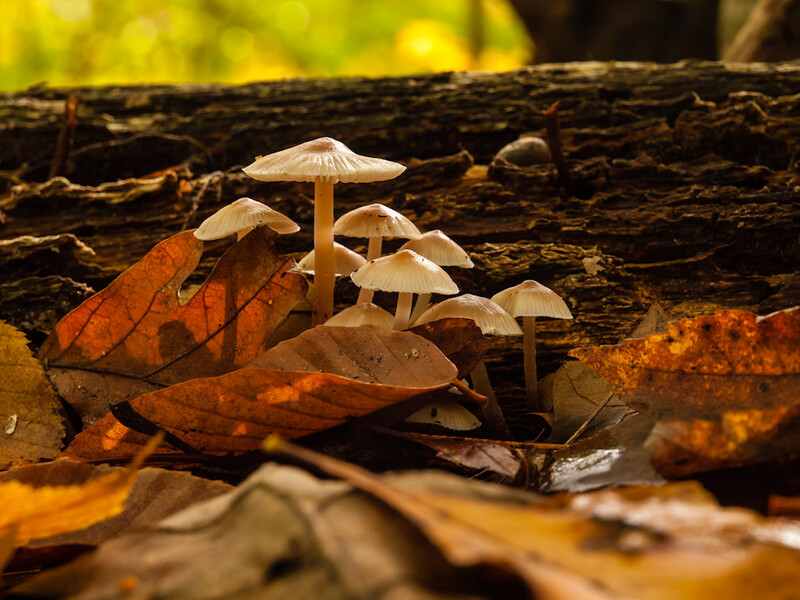 The richness in the mushroom shots is beautiful…Happy New Year. Congratulations on the new job! Looking forward to what you see when you get out of the woods (even if it is just your lunch)! After reading your prelude I have to say that you are pretty tough on yourself! Anyway I loved your series of best shots for the year. 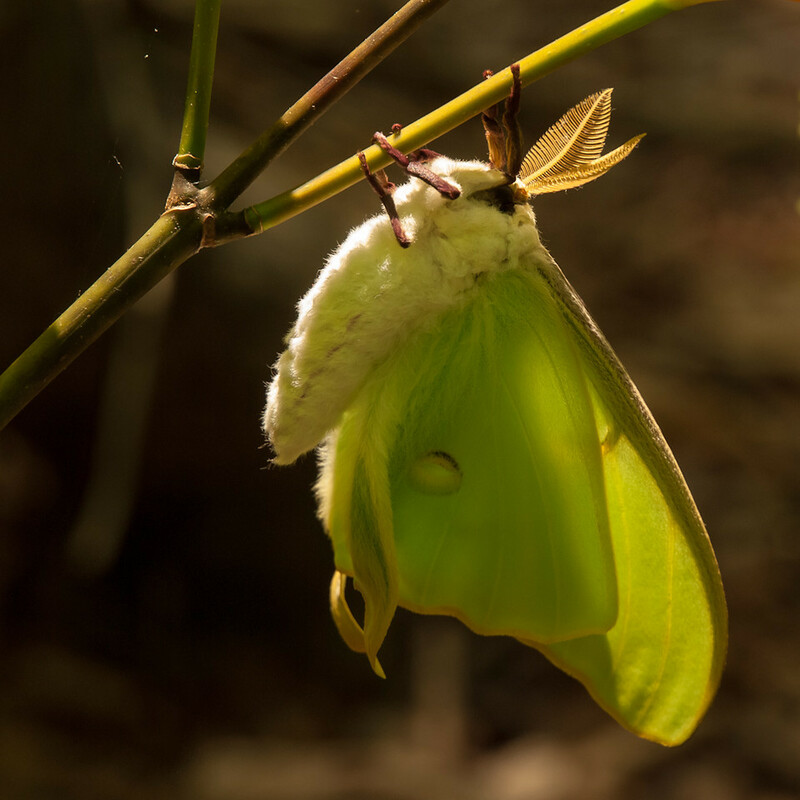 I thought it was a great stroke of luck for you to happen by a newly emerged luna moth pumping up its wings, and your photograph of it was wonderful. 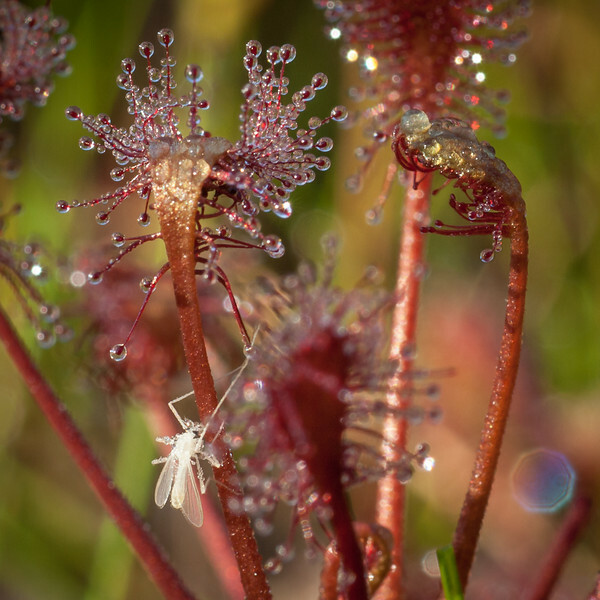 I think my very favorite photo was of the sundew plants… very alien and very beautiful. Your top photo is so beautifully composed. I loved that the trees are at different angles due to their positioning on their respective rocks. Congratulations on a very good year. One wicked good “Best Of” Kris. I have to say “Nevermore” is my favorite. The detail is amazing!